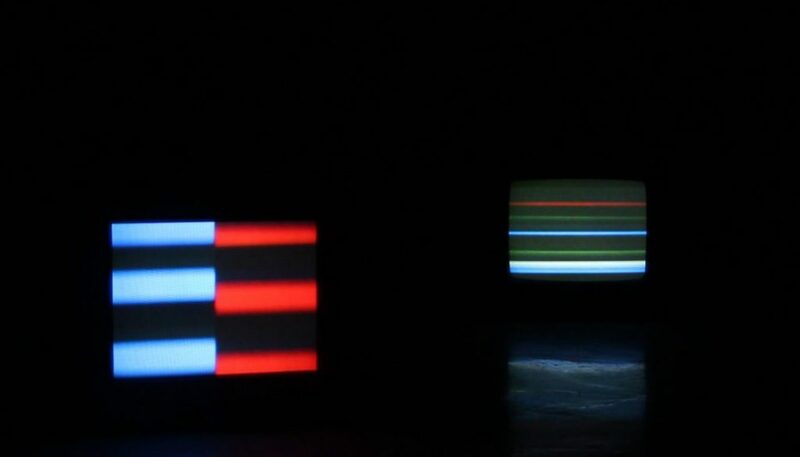 Invisible light is an installation which uses capability of digital and analogue devices and their glitches which are then used to create the play of light and sound, which organically changes. Focus of the research is digital light which is invisible to the human eye but visible through digital camera. Projection light is discontinued, and that discontinuity enables watching a route of the colours by adjusting the exposition from 1/30 to 1/4000 seconds. Video is recorded without sound and played by DVD player which is connected to television or projector, which then interprets the video and creates its own sound. Every colour has its own sound which changes when the colour on the display changes; this is how the sound-scape is created. Installation is composed of several televisions put in a space, set-up depending on the sound of the space. Vanda Kreutz was born in 1990 in Zagreb, Croatia. She graduated in animation and new media from the Academy of Fine Arts in Zagreb in 2018. In her art praxis she researches the fields of experimental film, animation, photography and audio-visual installations. Since 2014 she has been involved in educative film workshops for children and youth.